On the afternoon of August 31th. 2010, Comrade Li Changchun accompanied by Politburo Standing Committee member of the State---Ma Kai, Director of Press and Publication---Liu Binjie, Deputy Director Li Dongdong, Wu Shulin, Sun Shou Shan, Yan Xiaohong and other relevant leaders, visited CNKI booth located at the seventeenth session of the Beijing International Book Fair. Wang Mingliang, The proprieter of Chinese Academic Journal (CD) E-magazine publisher and General Manager of CNKI introduced integrated digital publishment and its domestic and international market business model of CNKI, the feature of their products and services and market size. He also reported on the development of digital publishing industry in CNKI, the construction of knowledge infrastructure with academic literature, the services to China's "four-building" (political, economic, social and cultural), the progress made by the implementation of national culture "go to oversea" strategy and answered problems which Li Changchun and other leaders concerned about. When Wang Mingliang was Introducing digital publishing features of CNKI, he also demonstrated the "Personal Digital Library" which designed for Comrade Li Changchun with "China Reform and Development of Cultural Industries" as its subject. Academic Literature Full-text Database and the standardized data from the massive resources of international academic literature is the basic information source of "Personal Digital Library". The customized and personalized content from flexible, convenient and professional information is the main delivery means of knowledge services for leaders, experts and researchers and all kinds of individual needs. It can provide a comprehensive, systematic, accurate and timely information and intelligence research tracking service. Comrade Li Changchun and other leaders watched the demonstration and the new digital publishing and knowledge service model with great interest and Li was pleased to accept the "Li Changchun’s Digital Library on Reform and Development of China's Cultural Industry Research Project " presented by Chinese Academic Journal (CD) electronic magazines and CNKI. In the afternoon, Cppcc vice chairman and the vice chairman of Association Central Committee---Luo Fuhe also visited CNKI exhibition. President Luo gave many good suggestions as CNKI’s old reader. 31th. 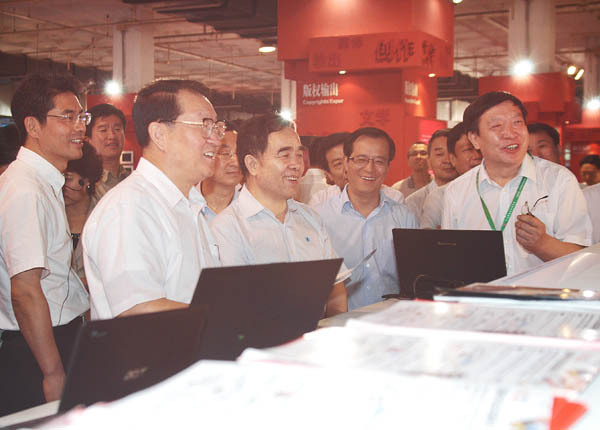 Aug. 2010, Comrade Li Changchun(member of the Standing Committee of the Political Bureau of the CPC Central Committee) visiting the CNKI booth at the 17the Beijing International Bookfair. Politburo Standing Committee member Li Changchun met with Iranian President Mahmoud Ahmadinejad - Ahmadinejad at Local Time on 28th. September, 2010 morning in Tehran. 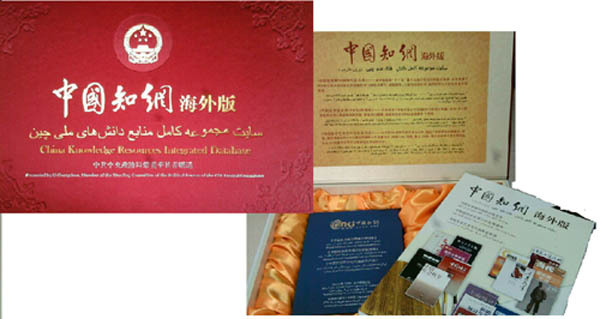 Comrade Li Changchun presented the National Present to Iranian President, including "China Academic Literature Full-text Database (Overseas Edition)", "Chinese Economic and Social Development Statistical Analysis Database (Overseas Edition)" and "Chinese Culture and Art of Publication Selected Master and Masterpiece (Overseas Edition)" published by CNKI. "China Academic Literature Full-text Database (Overseas Edition)" is the publication of major construction project achievements during "the Nineth Five-Year", "the Tenth Five-Year" and "the Eleventh Five-Year" Plan and representative works in the China academic publishing "going overseas". Its comprehensive, systematic and continuous collection of 7,672 kinds of journals full-text publicly published since 1915 in China records the hundred-year of China academic research results and important events, especially the political, economic construction, social, cultural ideological, cultural and intellectual essence in last 30 years after reform and opening up in the process of the rising of China, which is one of the important window for the world's objective, in-depth understanding of China. "Chinese Economic and Social Development Statistical Analysis Database (Overseas Edition)" is a digital databases with social, economic statistical indicators data as the main content. Currently, it has collected 635 kinds of statistical yearbooks, statistical summaries, compilations and development reports openly published in China since 1949 and records the real-time official statistical agency's monthly, quarterly statistical data with indicators covering all national economic and social development fields. It can support basic indicators queries, composite index calculation, indicators and targets for building a database extract numerical analysis as the essential tools of interpretation of China's national conditions and development by the the economists and international community. "Chinese Culture and Art of Publication Selected Master and Masterpiece (Overseas Edition)" selects a thousand masterworks written by 200 well-known contemporary writers such as Lu Xun, Lao She, Mo Yan and so on since the Xinhai Revolution from 260 kinds of Chinese literature and art, including fiction, poetry, prose, drama, reportage as well as 100 well-known literary critic's comments on these works. It is an important platform for the literary arts and the international community to understand and study contemporary Chinese literature and its cultural values.